Ready for a spa getaway? Steeped in relaxing lemon balm, memory-boosting rosemary, skin-loving sea buckthorn and raspberry leaf - a women's health essential - this subtly fruity white tea will leave your mind and body feeling gently rejuvenated. Plus its fresh apple and wildflower aroma is as soothing as it gets - like aromatherapy in cup. The only thing left to do? Throw on a facemask and bliss out. Plus its fresh apple and wildflower aroma is as soothing as it gets - like aromatherapy in cup. Throw on a facemask and bliss out. 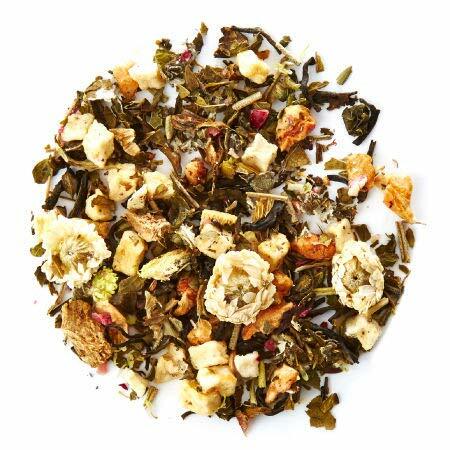 INGREDIENTS : Apple, white tea, ginger, lemon balm, licorice root, rosemary, raspberry leaves, cranberries, sea buckthorn, chamomile, sandy everlasting flower, natural flavouring. If you have any questions about this product by DAVIDs TEA, contact us by completing and submitting the form below. If you are looking for a specif part number, please include it with your message.